Ocean Literacy: The Essential Principles of Ocean Sciences K-12 has been a groundbreaking document, both as a product and because of its development process, both of which are creating a ripple effect across the entire ocean sciences education community and beyond. The Ocean Literacy Framework, comprised of the Ocean Literacy Principles and the Ocean Literacy Scope and Sequence, is the first consensus set of documents to identify, articulate, and organize the core concepts of ocean sciences for educational purposes. It has become a powerful rallying point for elevating the prominence of ocean sciences in the mainstream K-12 and informal science education systems. While it is not new for educators and scientists to work together on a project, the process of continued collaboration and partnership between educators and scientists in different agencies and organizations is significant, and has added to the potency of the Ocean Literacy Campaign. The Ocean Literacy Framework has been the foundation and/or inspiration for numerous significant accomplishments nationwide and in several other countries. Here we share a few of those high impact accomplishments. The Ocean Literacy Principles inspired other science disciplines to identify and organize their big ideas. The eight Great Lakes Literacy Essential Principles are based directly on the Ocean Literacy Principles. See the www.greatlakesliteracy.net website for more details. At least three grant programs in two large federal agencies, NOAA and NSF, require that proposals for projects focusing on the ocean as a part of the Earth System must address the Ocean Literacy Principles in order to be considered for funding. NOAA Office of Education: Environmental Literacy Grant (ELG) awards support formal and informal education projects. The informal education awards support education projects designed to engage the public in activities that increase ocean and/or climate literacy and the adoption of a stewardship ethic. They support projects that involve: community outreach, citizen science, civic engagement, social networking, media campaigns, professional development for educators, interpretative training, building networks of aquariums, high level data visualization systems, and live video feeds. The awards for formal education promote changes in K-12 education to expand the amount of Earth System Science taught in the classroom and improve student learning and application of that subject. Successful projects catalyze change in K-12 education through development of new programs and materials and/or revision of existing programs and materials and/or by supporting transformative methods that expand or lead to the expansion of the use of Earth System Science in K-12 classrooms. NOAA Office of Education: Bay-Watershed Education and Training (B-WET) program provides grants in support of locally relevant experiential learning through meaningful watershed educational experiences in the K-12 environment. Funded projects provide meaningful watershed educational experiences for students and related professional development for teachers in support of regional education and environmental priorities. NSF, Directorate for Geosciences, Ocean Science Division (OCE) Centers for Ocean Sciences Education Excellence (COSEE) provides grants to support the COSEE Network, which consists of eleven coordinated COSEE Centers, fosters the integration of ocean research into high-quality educational materials, enables ocean researchers to gain a better understanding of educational organizations and pedagogy, provides educators with an enhanced capacity to understand and deliver high-quality educational programs in the ocean sciences, and provides material to the public that promotes a deeper understanding of the ocean and its influence on each person’s quality of life and our national prosperity. Kazuya Hirai leading a teacher workshop for fisheries high school teachers following the Japan Ocean Literacy Symposium at the Tokyo University of Marine Science and Technology. There have been at least nine conferences (six in the U.S., one in Australia, one in Japan, and one in Chile) entirely devoted to discussing and reflecting on the Ocean Literacy Framework and/or the Ocean Literacy Campaign. 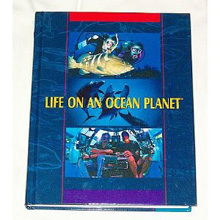 Cover of the NMEA Life on an Ocean Planet textbook from Current Publishing. Life on an Ocean Planet is a nationally distributed high school marine science text book that evolved from two years of research and alliance with many science and science education-based organizations such as NMEA, COSEE, NOAA, and the NMEA Ocean Literacy Committee. Ocean Literacy: The Essential Principles of Ocean Sciences K-12 provided an early framework for Current Publishing to use in developing their curriculum content for Life on an Ocean Planet. Moreover, the development process has been a cross-disciplinary, team effort involving: eight NMEA members serving as the Current Publishing Ocean Literacy Advisory Team; the expert curriculum writing and development skills of marine science educators; and 22 classroom teachers and research scientists across the country who provided their pedagogical and scientific expertise as reviewers. Each chapter of the 2010 edition, which prominently acknowledges NMEA as a partner, has each chapter correlated with the Ocean Literacy Essential Principles and Fundamental Concepts. These chapter correlations document where specific ocean literacy concepts are introduced and taught. They are easily identified in chart format for teachers in the Teacher Curriculum Guide. The textbook is grade level appropriate for high school students, and written in a friendly, motivational style to enhance science learning. The content is balanced with student-tested investigations and hands-on activities to ensure students achieve science understanding. Life on an Ocean Planet uses an interdisciplinary approach to integrate the curriculum areas of reading, math, language, and social sciences into the marine science content. For more information, please visit the website (http://www.currentpublishingcorp.com). 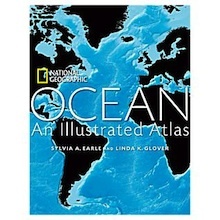 Cover of Ocean: An Illustrated Atlas from National Geographic. When focusing on standards-based content, achieving the “right” balance of depth and breadth in a curriculum is a challenge, one that teachers are often left to struggle with on their own. The GEMS/MARE Ocean Sciences Curriculum Sequence for Grades 3-5, funded by NOAA, brought scientists and educators together to suggest a balanced pathway through the body of ocean sciences content. Ocean Literacy: The Essential Principles of Ocean Sciences K-12 and the Ocean Literacy Scope and Sequence for Grades K-12 formed the basis of this curriculum sequence. The curriculum sequence will also be aligned with the National Science Education Standards and the science standards of 20 states. Scientists and educators worked through a multi-step process drawing on current research in ocean sciences and science learning, to form the conceptual framework, the progression of concepts, and the unit topics. They applied their specialized expertise to identifying the Ocean Literacy and standards-based concepts worth more time in classrooms according to one or both of the following criteria: 1) they are concepts that underlie essential understandings of a discipline, and 2) they are concepts that need more classroom time and contexts for most effective learning by students because they are developmentally challenging to grasp. What resulted was a versatile curriculum sequence for grades 3-5, comprising 25 60-minute classroom sessions organized into three units of study: ocean circulation, diversity of life in the ocean, and human impact on the ocean. The curriculum sequence has been piloted, and the team made revisions in the light of those results. As of the writing of this report, the curriculum is undergoing a national field test in 70 classrooms across the country. The curriculum, which includes teacher guides, student readings, data sheets and an instructional materials kit, will be revised further after the national field test; and by January 2011, will be available nationwide for schools to adopt from Carolina Biological. Newsflash: A new companion curriculum funded by NOAA, the Ocean Sciences Curriculum Sequence for Grades 6-8 and based on the Ocean Literacy Scope and Sequence for grades 6-8, will enter into the development process in early 2010. Flash animation for the Ocean Literacy Principles from COSEE NOW (http://coseenow.net/2008/11/ocean-literacy-interactive-animation/). COSEE Coastal Trends is partnering with Queen Anne’s County Public Schools, MD to formalize a semester-long, entry level, secondary school ocean sciences course using the Ocean Literacy Principles as the foundation. During the summer of 2008, a course curriculum outline and associated lessons/activities based on the Ocean Literacy Principles were assembled. This course outline was tested with all incoming 9th graders in the two high schools in QACPS and in one Lee County High School in Alabama. The course curriculum was revised based on these teachers’ feedback during the early summer of 2009. 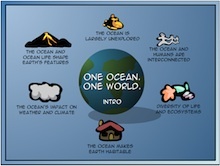 This revised curriculum included the integration of science-based, hands-on lab, field and computer activities for each of the Ocean Literacy: Principles. It also served as the basis of an implementation institute offered to 14 teachers in July 2009. These teachers will pilot the An Introduction to Our Dynamic Ocean course curriculum during the 2009-2010 school year and provide feedback for the second revision. Once these revisions are made (summer, 2010), the curriculum will be posted on the COSEE Coastal Trends (http://www.coseecoastaltrends.net) website and disseminated through the COSEE network. 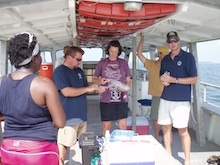 Participants collect data on a field trip during the Ocean Science Course Implementation Workshop. The Sant Ocean Hall at the Smithsonian Institution. To inspire awe for how vast, diverse, and unexplored the ocean is, and for how fundamentally different it is from land. Principle 1. Earth has one big ocean with many features. To provide a unique and engaging experience that demonstrates how the ocean works and how it is interconnected with other global systems. Principle 2. The ocean and life in the ocean shape the features of Earth. Principle 3. The ocean is a major influence on weather and climate. To demonstrate how life evolved in the ocean over billions of years and changed dramatically over time. Principle 4. The ocean makes Earth habitable. To instill in students an awareness of the great diversity of ocean habitats and ocean life, and of how much is still being discovered. Principle 5. The ocean supports a great diversity of life and ecosystems. To inspire and empower students to make the connection between the ocean and their daily lives, and to encourage them to continue exploring the ocean and to help conserve it. Principle 6. The ocean and humans are inextricably linked. It is necessary for ocean sciences to be in national and state standards in order for ocean sciences to be taught in schools more broadly. Ocean Literacy Framework is a tool that standards committees can use to inform how they might include ocean sciences in the development or revision of their science or environmental education standards. Thus far, a handful of states have used these tools in such a way. For instance, Maryland, California, and Michigan have cited the use of the Ocean Literacy Principles in the development of their environmental literacy standards. South Carolina, Florida, and Georgia have used the Ocean Literacy Principles in the development of their science standards; and high school students in Georgia are now required to take an ocean sciences course. Finally, in New Jersey, committed ocean literate educators and science coordinators leveraged the Ocean Literacy Principles to play a key role when their state science standards underwent revisions. The new standards, which focus on Earth systems science and biogeochemical cycles, are a close match to the Ocean Literacy Principles 2, 3, and 6. New Jersey now has state science standards containing important concepts integral and relevant to ocean science. The Centers for Ocean Science Education Excellence (COSEE) MidAtlantic was integral in influencing the final document. The Banana Slug String Band. Banana Slug String Band Music Group: The renowned children’s music group, The Banana Slug String Band, has produced a new album, ONLY ONE OCEAN, entirely focused on the content found in Ocean Literacy: The Essential Principles of Ocean Sciences K-12. The CD is produced with financial contributions from ten Centers in the National COSEE Network and from the National Marine Educators Association, the NOAA Office of Exploration & Research, The College of Exploration, and Dr. Sue Cook. The CD features several well-known guest artists who have contributed their time to the project. Some of the artists on the CD include: Brett Dennen; George Winston; Grammy Award winning BeaSoleil avec Michael Doucet; and Victor Wooten (two-time winner of the Nashville Music Awards’ Bassist of the Year, and member of the Grammy Award-winning super-group, Bela Fleck and the Flecktones). Banana Slug albums have won 16 state and national awards for excellence. Thousands of Banana Slug CDs are sold each year through eight distributors such as Amazon.com, Acorn Naturalists and Kaplan Early Learning, and as downloads through iTunes and other MP3 sites. In addition, the band plays over 20 major concerts and dozens of smaller shows each year. ONLY ONE OCEAN will bring the importance of the ocean to a large audience of parents and children not previously reached by the Ocean Literacy Network. Thank You Ocean Campaign: A widespread media campaign to raise awareness about the ocean has been initiated by the State of California, the NOAA Office of National Marine Sanctuaries, and the Ocean Communicators Alliance. The resulting Thank You Ocean Campaign provides videos, Public Service Announcements, podcasts, billboards and a web presence, all based on the Ocean Literacy Principles.